Our farm is located in the agricultural valley of beautiful Northern California. 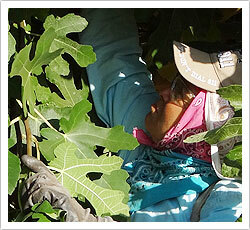 We are a family owned grower, packer, and shipper of California Certified Organic Fresh (CCOF) figs. We are large enough to consistently fill large receiver's demands, yet small enough to customize each order. We do not sell or ship to individuals. We only sell directly to consumers if they come to our farm during our season. Maywood Farms' entire operation is located in one site. This includes the orchard, packing shed, cooler, and Bob and Karen's home. We live, work, and play here. This set up allows us to start cooling the figs within 20 minutes of picking. Our central location also allows us to carefully monitor production, and adjust our volume according to sales. This ensures that the figs are shipped immediately after being fully cooled. Our farm fresh figs for wholesale customers are packed in 12 one-pint "open" baskets, 12 one-pint UPC coded clam shells or 8 UPC coded one-pound clam shells. 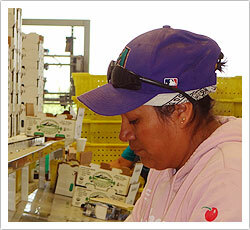 To serve our customer's needs, we offer boxes that are packed by ripeness. Our regular pack contains figs that have a minimum two-week shelf life. This pack is normally shipped to the chain stores and terminal markets. Our ripe pack has a five-day shelf life. These packs are preferred by restaurants and specialty markets that cater to customers who demand figs at their peak of flavor. 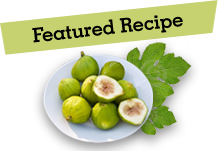 You are cordially invited to explore our site to learn more about our family, our farm and our figs. Please email us with any questions or comments you may have in regards to any aspect of our farm! Please Note: We do not sell or ship to individuals. We only sell directly to consumers if they come to our farm during our season.